San Antonio celebrates a one-of-a-kind holiday every April called Fiesta. It’s like a Tex-Mex Mardi Gras that pays homage to Mexican culture and its roots in San Antonio. Fiesta started as a one-day parade to honor the heroes of the Alamo and the Battle of San Jacinto. Today, more than 3.5 million people enjoy this premier festival featuring parades, live music, children’s activities, non-profit fundraising events, and more. I didn’t grow up with a sense of home. We moved around a lot, and I was shuffled between parents. I want my kids to have roots. They are native San Antonioans, and I hope they grow up to be proud of our city and its culture. Last year we started some fun Fiesta traditions, and the celebration continued this year. We made paper flowers at our homeschool co-op, and I’m in love with how they turned out! 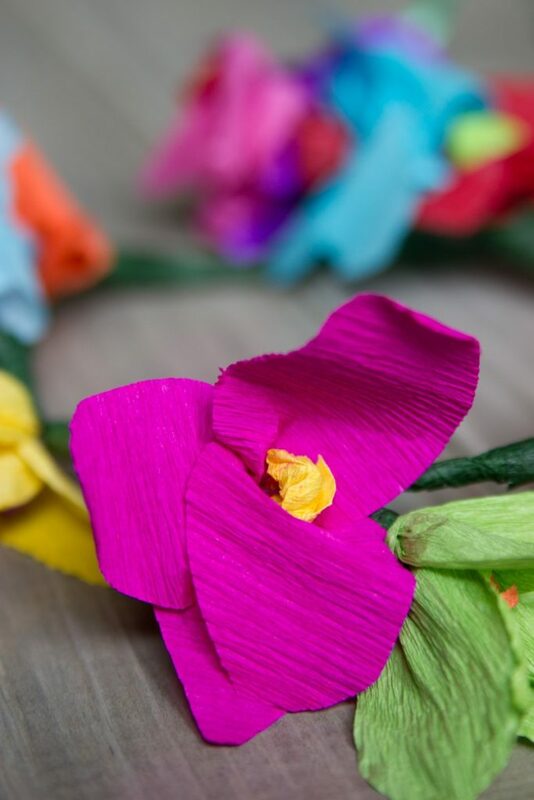 Brightly colored crepe paper and a few simple materials make for a beautiful and festive handicraft perfect for celebrating Fiesta, Cinco de Mayo, or just about any fun time. 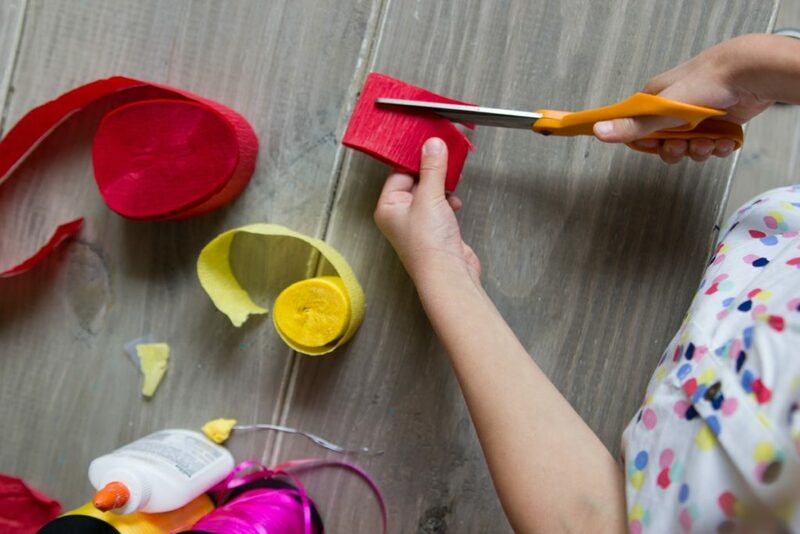 This handicraft is easy enough that most children 6 and up could do it on their own. Younger children can help with some of the steps, but would need assistance. I actually enjoyed this handicraft a lot and spent several hours making flowers for crowns to give to some friends. 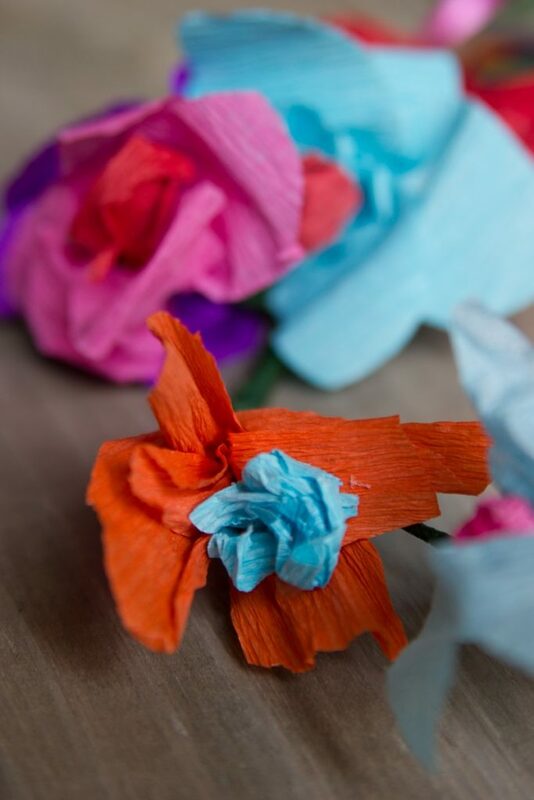 I used crepe paper streamers for my paper flowers bucks that is what I had on hand. 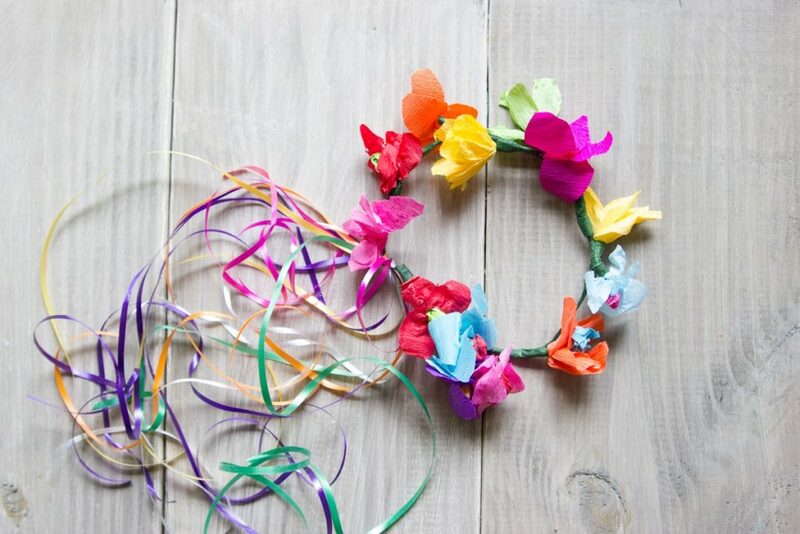 The streamers make a small 2- to 3-inch flower that is the prefect size to turn into a flower crown or in a mini bouquet. 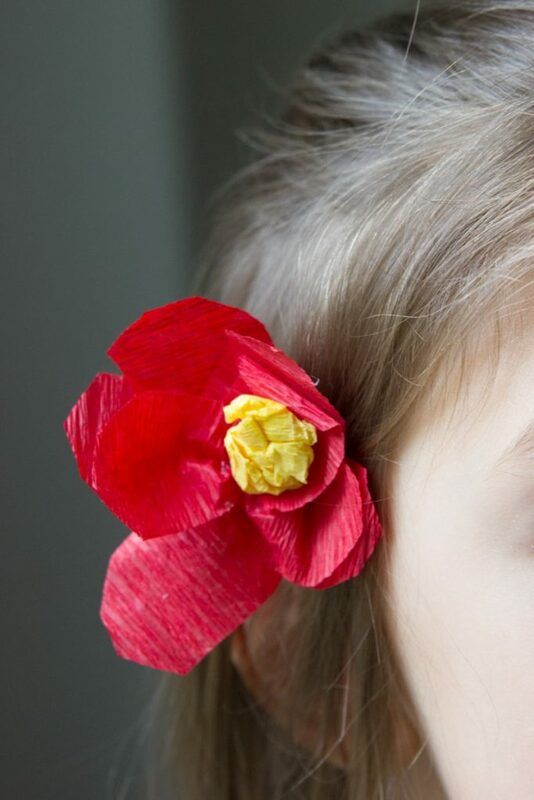 If you want larger flowers, you’ll want to use crepe paper sheets. Some Michaels stores carry 6×6 and 12×12 sheets, which would work well for this project. You can also order large crepe paper rolls from special paper stores if you plan on doing a lot of projects with it. 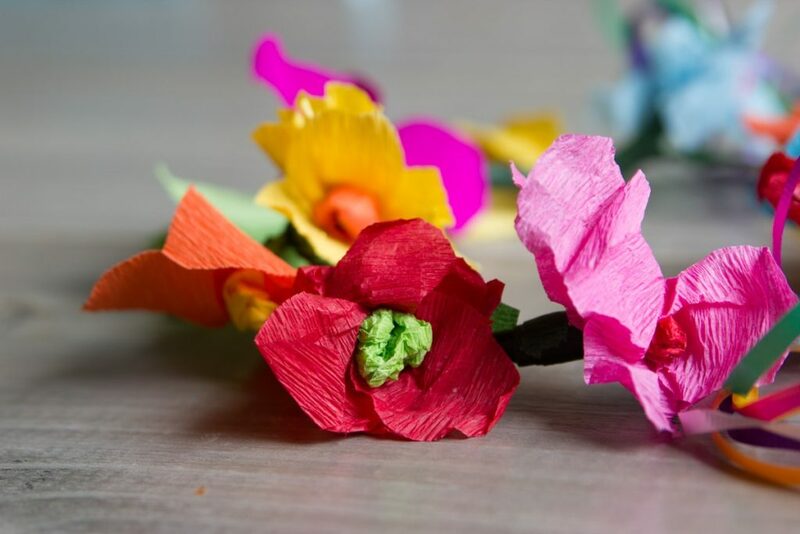 Crepe paper has some stretchability and is stronger than tissue paper, which makes it an ideal choice for making paper flowers. 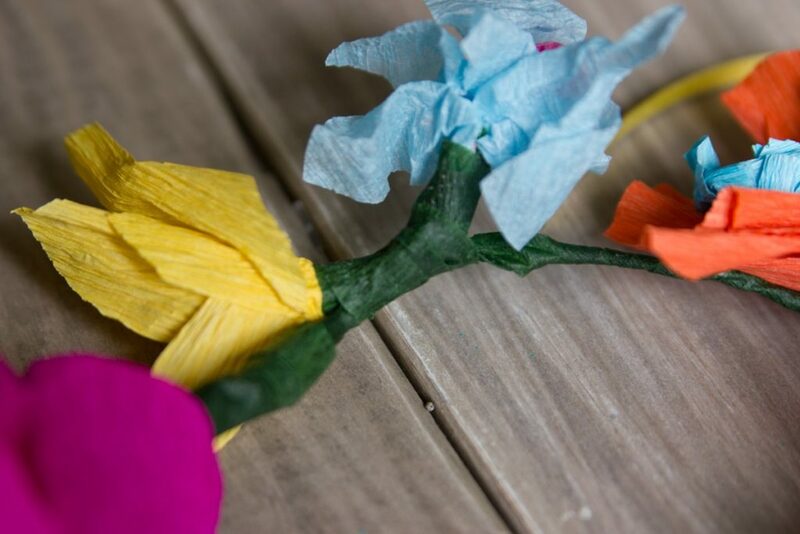 Crepe paper sheets are even more durable than crepe paper streamers and the colors are often more vibrant. It’s hard to find though- I couldn’t even find a good option on Amazon! 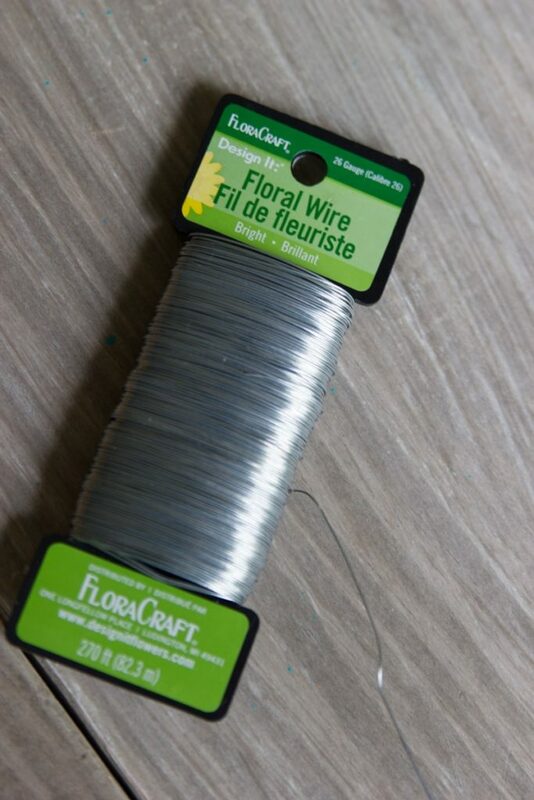 Start by cutting a length of floral wire for your stem. I cut about 6 inches and folded it in half for extra strength and a short stem. Next, select a color for your flower’s center. 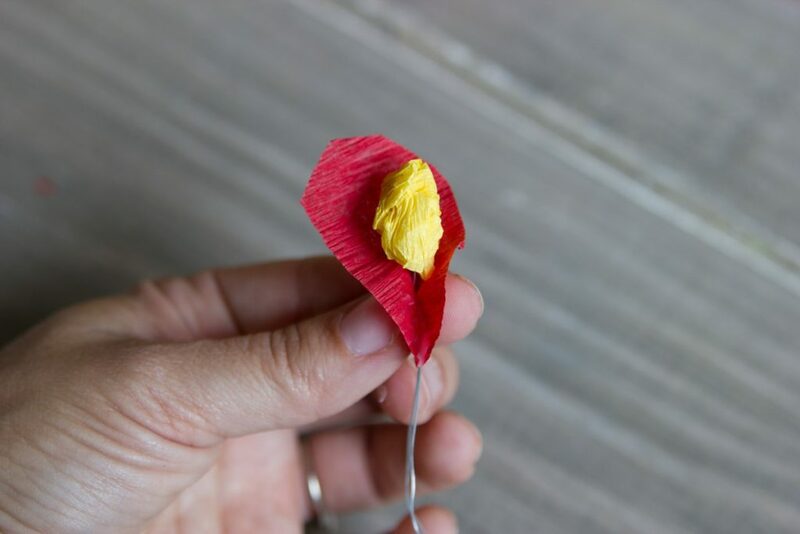 You’ll need a small piece or scrap of crepe paper to squish into a ball. 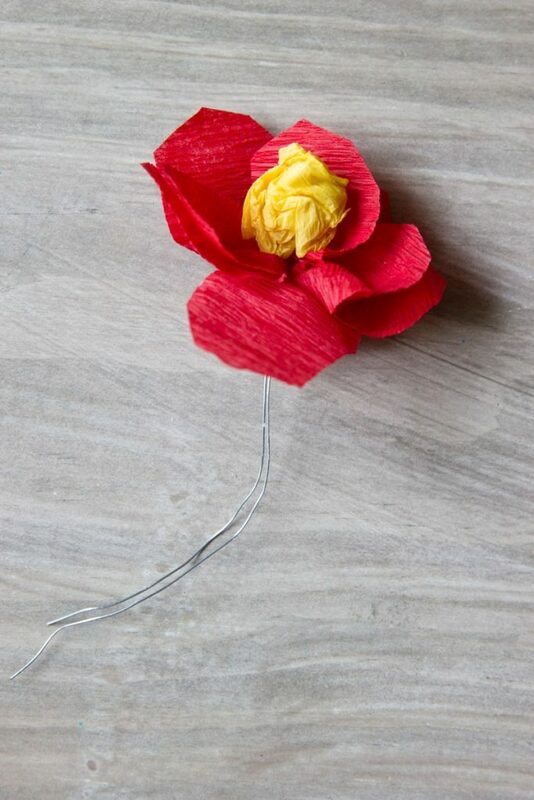 Add a dab of glue to your balled up crepe paper and attach it one end of the floral wire. Crepe paper stretches and molds easily so pinching it into place works well here. Now it’s time to cut out your petals. 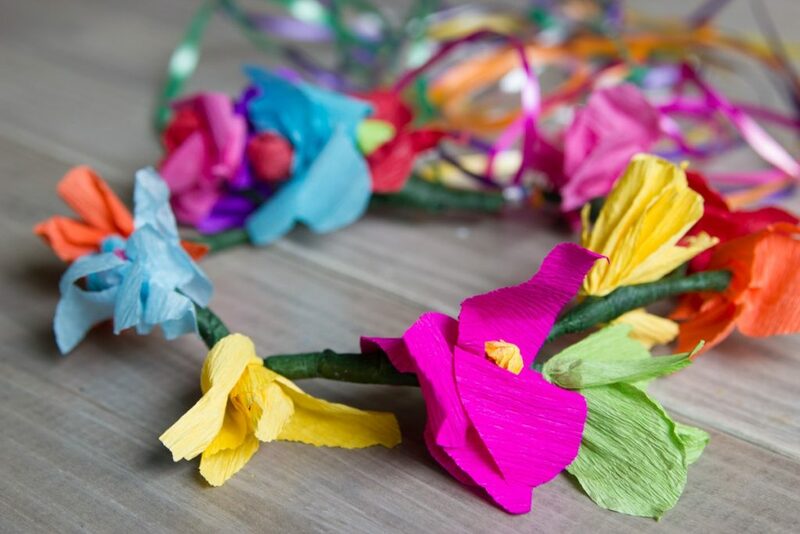 If you’re using streamers, cut a length of about 12 inches and fold the streamers into the length you want your petals. Mine were 2-3 inches. 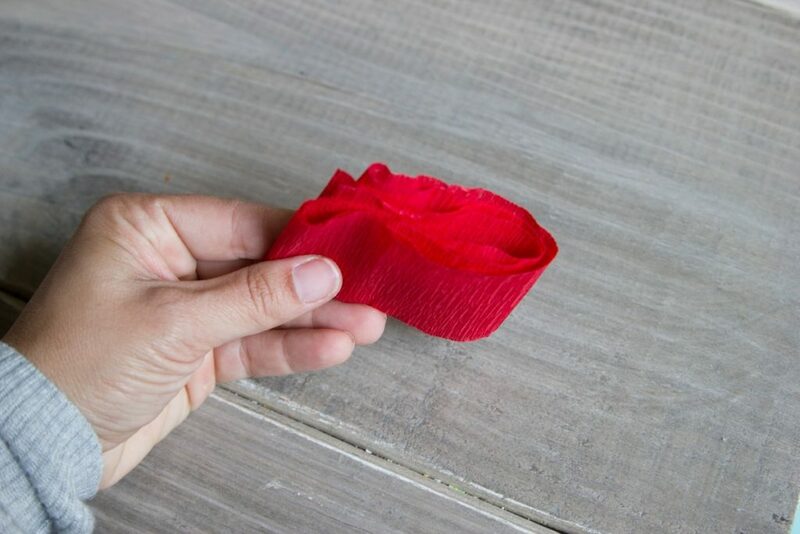 Cut out a petal shape from your folded streamers, making sure not to leave any folded edges intact. 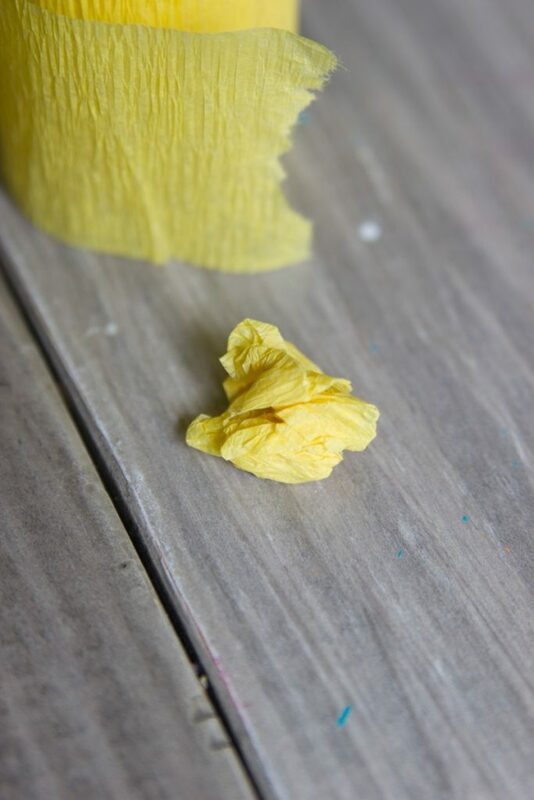 Once you have your petals cut out, add a dab of glue to the bottom of the first petal. 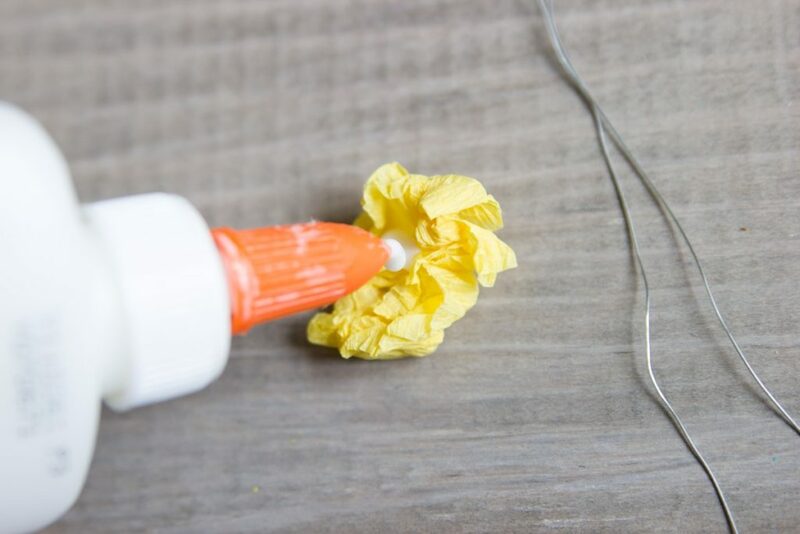 Pinch the petal with glue around your flower center that is already glued onto the floral wire. Continue adding petals around the center stem until you are satisfied with the look. Most of my flowers had 4-8 petals. 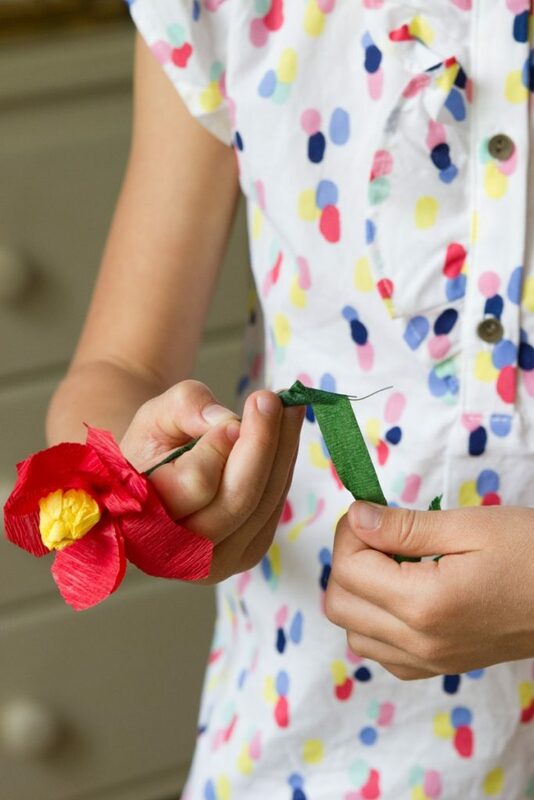 Then, wrap floral tape around the wire to create the look of a stem. And that’s it! 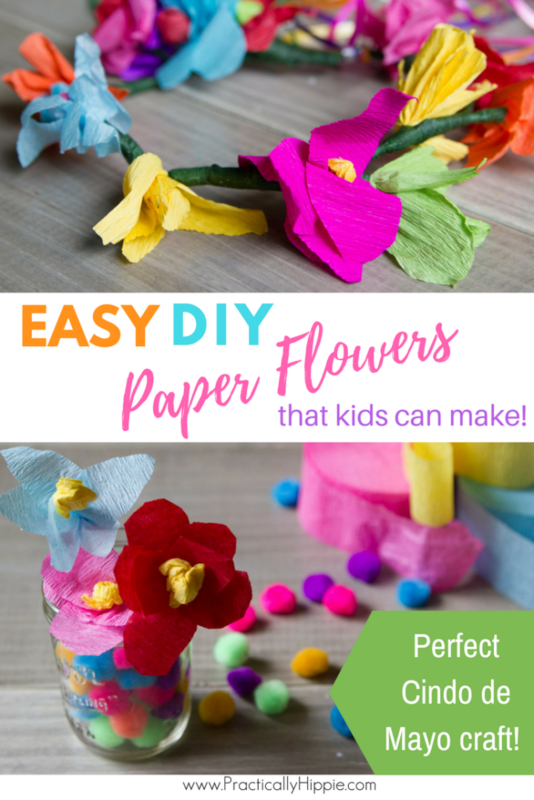 Now you can make paper flowers for everyone in your life. Or wear one in your hair like my girl loves to do. 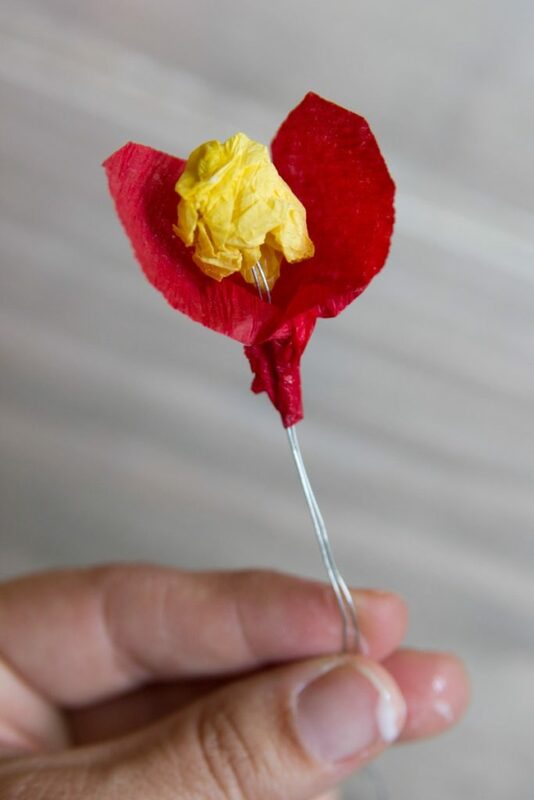 Of course you can’t just make one paper flower. 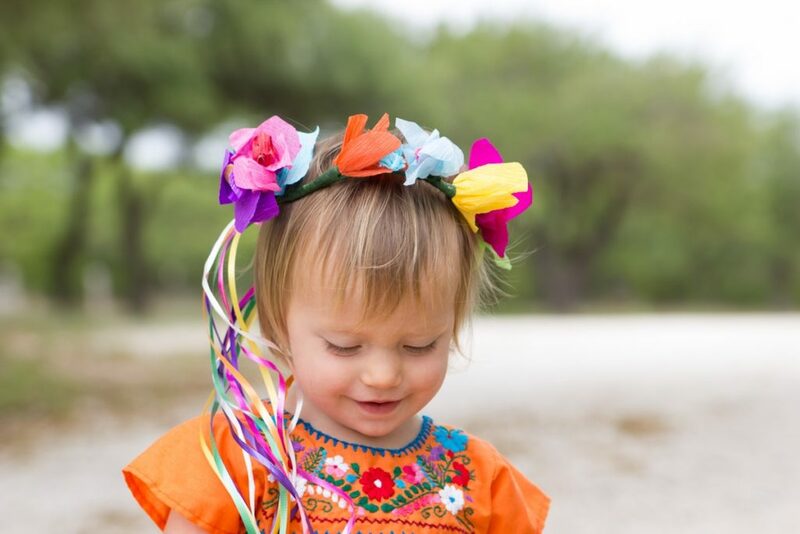 Paper flower crowns are a staple accessory here in San Antonio during our Fiesta celebrations. Putting flowers together to make the crown is super simple and just takes some floral tape and time to wrap. Start connecting the flowers by placing two of them side by side with stems touching. Offset the flowers so they are not at the same level, but one is higher than the other. 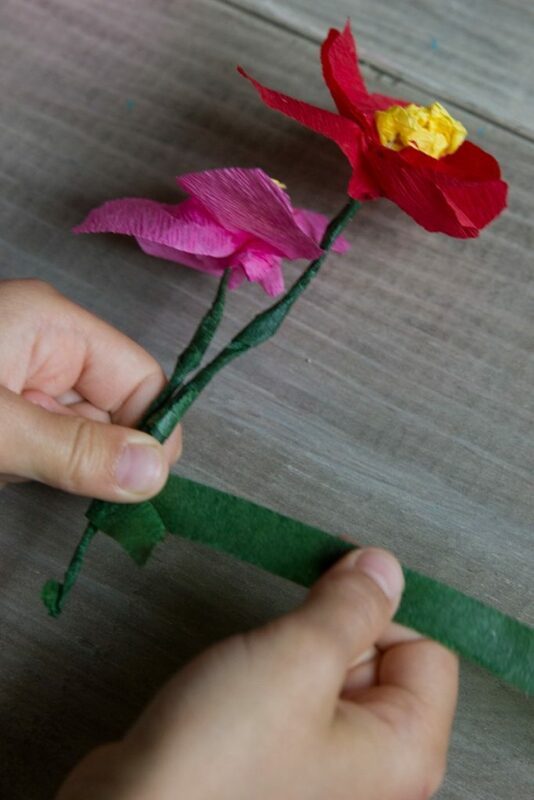 Use floral tape to wrap the two stems together to make one unit. 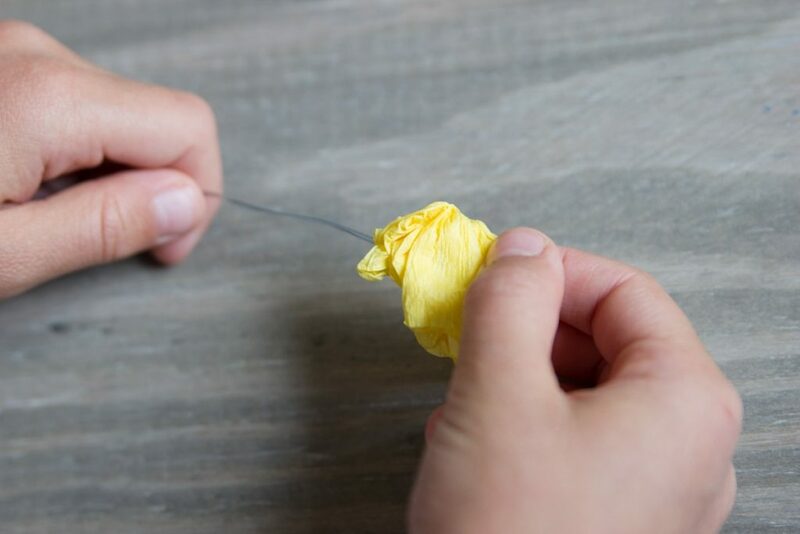 When the flowers are wrapped and joined together, continue this process by adding another offset flower to make a chain. When you have enough flowers, gently bend the wire stems into the shape of a crown. 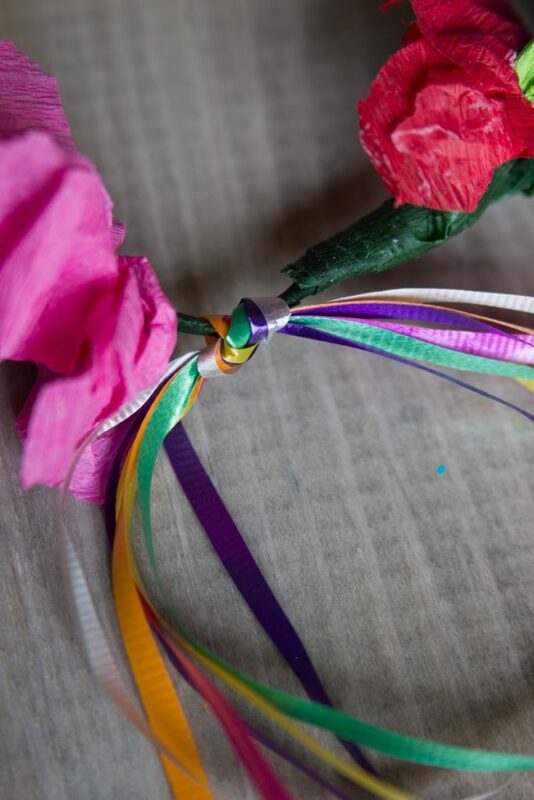 Join the last two flowers with floral tape to form a full circle. For a festive touch, add a curling ribbon tail to your crown. 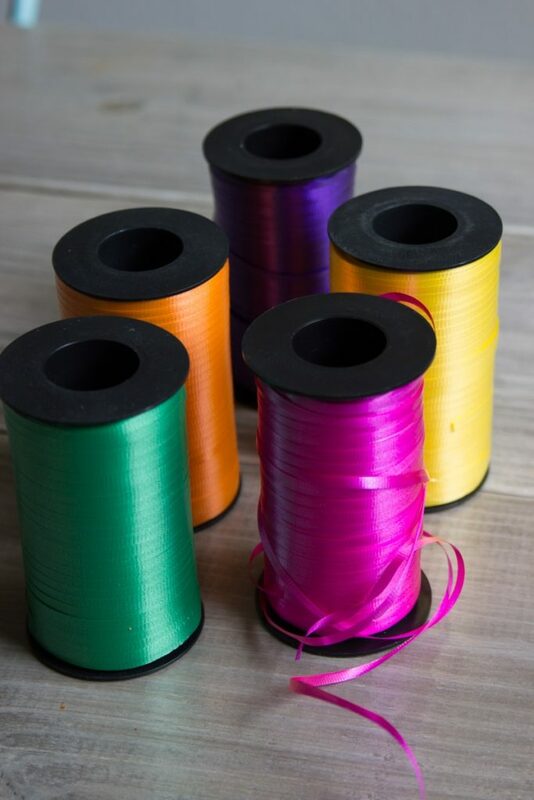 Cut off a length of curling ribbon in several colors. The length will depend on how long you want your tail. I used a length of about 3 feet. Hold the curling ribbon together making sure the ends are somewhat even. Tie the group of ribbon around your flower crown leaving the two groups of ribbon as the tail. And that’s it! 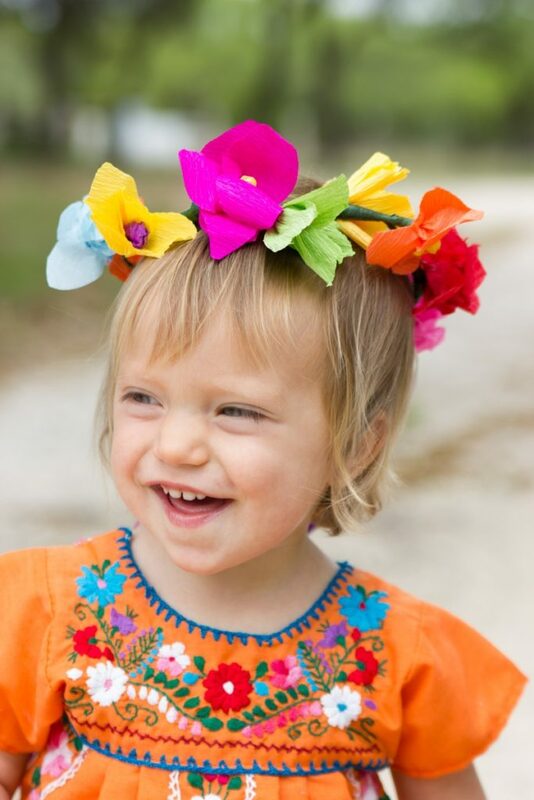 Enjoy your beautiful Mexican-inspired DIY paper flower crown. 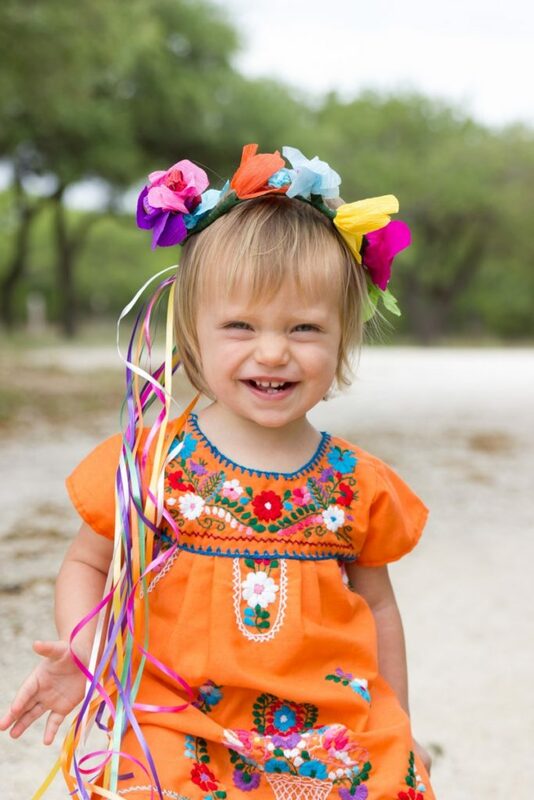 And just because she’s stinkin’ cute, I have to share these photos of my baby wearing her crown, ready for Fiesta. 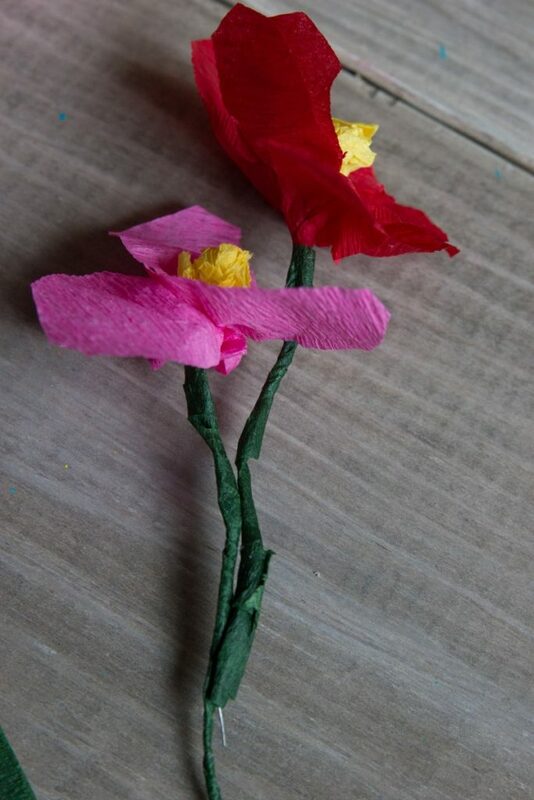 We also made some flowers to keep on hand for decorations. 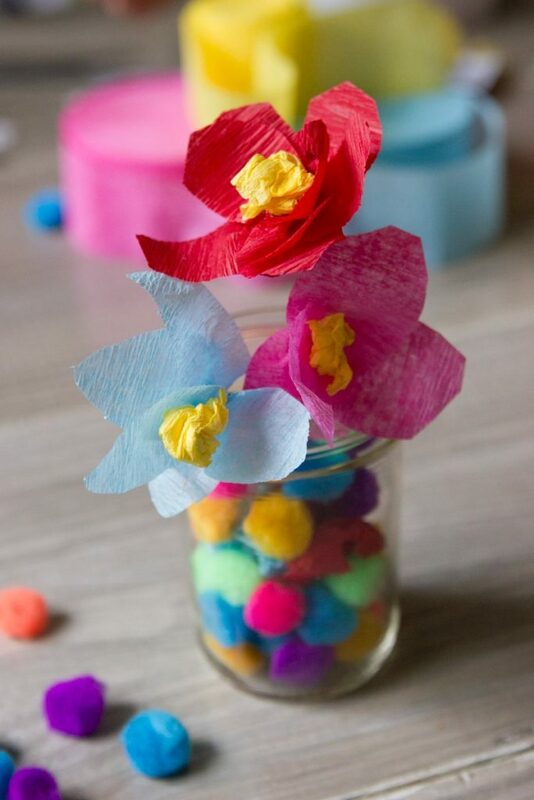 I added some craft pom poms to a pint-size mason jar and stuck in some flowers. 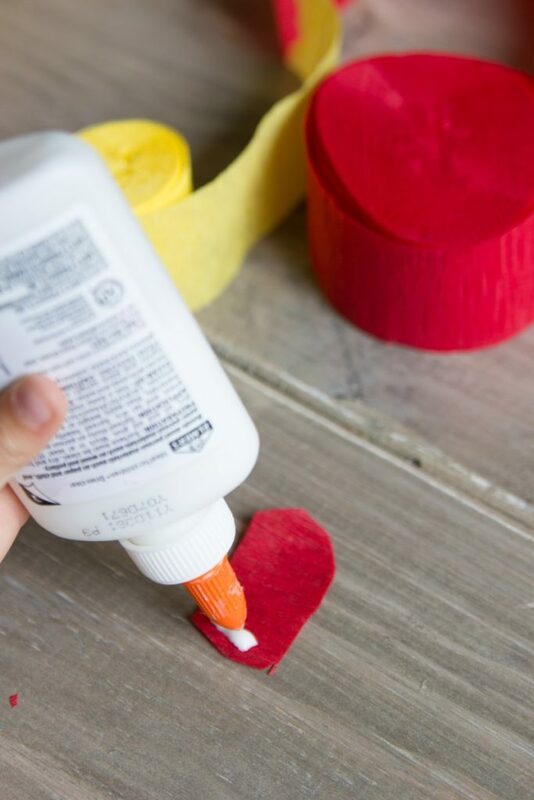 This simple decoration is so festive! 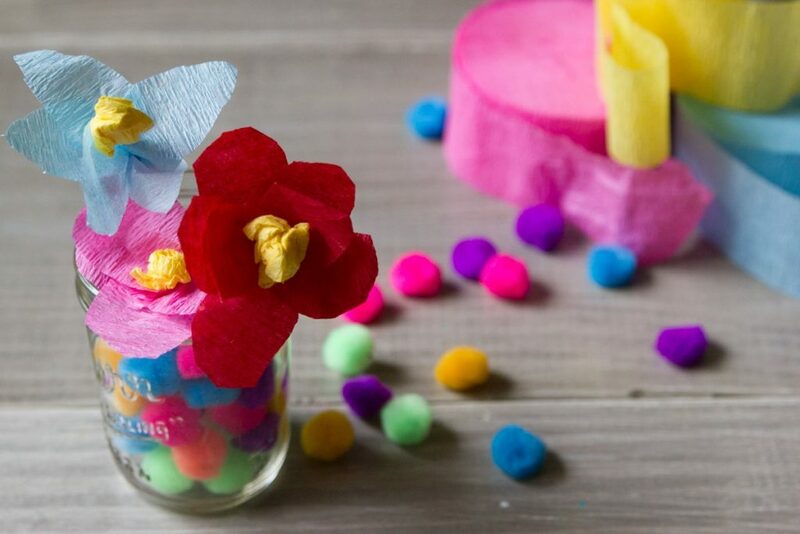 There are a million ways to use these adorable paper flowers. I’d love to see what you do if you try your hand at them!